Check the time until the next A train with this nostalgic, New York City subway watch. 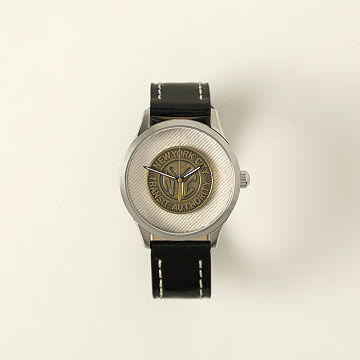 Check the time while you wait to take the A train with this watch featuring nostalgic pieces of NYC subway history. An authentic 70's era token is set on a circle of canvas token bag used by the MTA to transfer tokens throughout the system. A tribute to modern material culture, this smart timepiece will add urbane flair to your look. Officially licensed by the New York City Transit Authority, it also features a brushed, stainless steel case, battery-operated Japanese movement, and "authentic 1970-1980 NYC token" engraved on the back. Made in Hong Kong. I love this because it takes me back to subway days! I wear it every day and i love it for every occasion formal or casual. This is a beautiful watch, a true gem. Not your ordinary Fossil watch!